Around this time of year, the average gardener is busy with seed collecting. After all, the first months of the year are the ideal time to sow. The seed trays can benefit from the warmth indoors and by the time the seedlings may be potted, the plants can grow further outdoors. But how does such a seed actually come about? Flowers come in all kinds, scents and colours. From the most striking forms such as the Strelitzia to much more unobtrusive inflorescences such as grasses. Despite the large differences in appearance, the construction is more or less the same. At the heart of the flower is the ovary, which resembles a bottle with a long neck. This neck is called the style. On top of the style is a sticky cushion; the stigma. The ovules lie in the abdomen of the bottle, the ovary. The ovary with style and stigmas are the female parts of the flower. 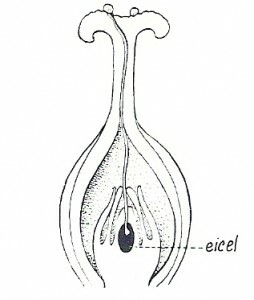 Around this ovary are the stamens, each with an anther at the top. The pollen comes out of the anthers. The stamens form the male parts of the flower. Not all plants have both female and male flowers. Think for instance of the Kiwi plant. We call that dioicous. You then need both a female and a male plant to obtain seed. If the flower contains both male and female parts, we call it monoicous. 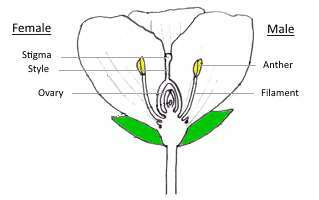 For a successful fertilisation of the ovary, the plant must be able to obtain pollen on the stigmas of other flowers of the same species (cross-pollination). Some plants use the wind (for instance grasses, and some deciduous trees), others use insects. 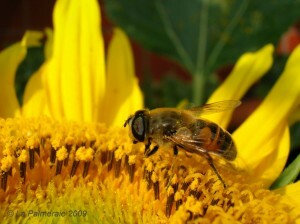 Flowers use their nectar to lure hungry insects from flower to flower. The sticky pollen remain attached to the hairy body of the insect and end up on the stigma of the next flower. But of course you can do this yourself with your finger! You can then be much more precise and grow hybrids, for example. The pollen can of course also end up on the stigma of the same flower or on other flowers of the same plant (self-pollination). 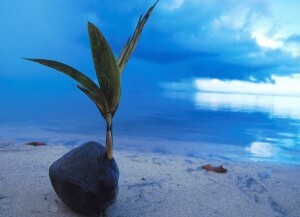 If you have a successful fertilization, you will then have an identical clone of the plant. After all, no new DNA has been added. When pollen ends up on the stigma, it is called pollination. From a pollen, a thin tube grows down to the ovule through the style, which is then fertilized. The seed grows out of the fertilized ovule, the ovary grows into a fruit. Just think of an apple. On one side, the dried sepals are clearly present and on the other side the dried flower residues are still present. If you look at the inside carefully, you will notice in each part 1 or more seeds, something similar can be seen with most fruits. If the flower is not pollinated properly, the fruit will show an anomaly; e. g. a dent. Each segment must have pollen in order to obtain a nice round fruit. The fruit contains the seeds. Of course, these must get back into the ground again so that the whole cycle can start over again. 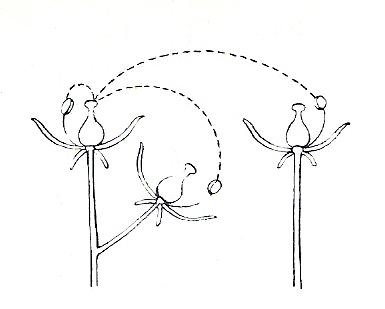 Some plants do this themselves by swinging their seeds away. Others produce tasty fruits for this purpose, which are found elsewhere thanks to greedy animals. For instance, you can easily grow a new date palm from ordinary dates you buy in the supermarket. 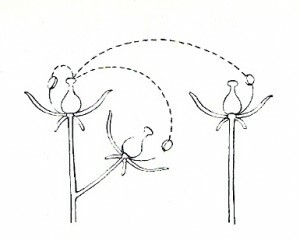 Other plants use the wind to spread the seeds or even the water. Think for instance of the coconut. It is taken by the sea to be washed up somewhere else to germinate again. The seedling will do everything it can to carry flowers as quickly as possible and in grow fruit. And so the cycle continues uninterruptedly.